If you are currently studying with ILSPA, you have the opportunity to attend one of the tours which take place monthly at the Royal Courts of Justice. The feedback which we receive from students shows the tour to not only be an enjoyable and informative day out, but also a valuable resource for their studies. The tour is conducted by Amanda Hamilton, who is the Chief Executive of the National Association of Licensed Paralegals as well as one of our Patrons. Amanda also taught ILSPA’s Legal Secretaries Diploma course for 12 years! She is a very knowledgeable and entertaining guide with a deep understanding of the Royal Courts of Justice and law in general. The day begins with a structured tour of the wider area of “Legal London”, which is the maze of buildings, gardens and courtyards surrounding the Royal Courts of Justice, including one of the oldest buildings in London, dating back to 1185! The students then explore the Royal Courts of Justice itself, starting in the main hall and passing through some of the landmark areas of the courts. If you are not already aware, the courts are huge, containing 86 courts, 3.5 miles of corridors and hundreds of admin offices! Students have the opportunity to learn more about the court’s history, including a better understanding of the traditional way in which solicitors and barristers used to work and how this has changed. Amanda welcomes questions throughout the tour and sets the attendees fun assignments, which provide students with an excellent opportunity to gain more in-depth knowledge, as well as navigate the courts and gain familiarity with the area known as Legal London. “I just wanted to write and thank you for the opportunity the course gave me to attend the Royal Courts of Justice. It really was a fascinating day and it was so interesting to sit in on various cases and see judgments being made. Amanda was so knowledgeable and made the day really worthwhile with her enthusiasm. It certainly left me wanting more, and I’ve arranged things at work to allow me to take time to go to the various courts in Birmingham so I can further learn about the differences in the court system. I’m also planning a trip back to London before long to visit the Old Bailey – a friend was inspired to join me even though she is not doing anything law related currently! “I just wish to inform you that I have been on the tour led by Amanda Hamilton today, and it was excellent. Amanda was very knowledgeable, engaging and funny and kept us entertained with interesting facts from the law world. 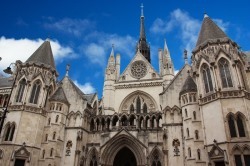 You can find further information about the tours, as well as future dates, by visiting https://www.institutelegalsecretaries.com/article/royal-courts-of-justice-tour/ or emailing us at info@institutelegalsecretaries.com to book your place.